By Peter Schwartz, First published in 1992 and second edition in 1997. “Artful scenario spinning is a form of convergent thinking about divergent futures. It ensures that you are not always right about the future but–better–that you are almost never wrong about the future. The technology is powerful, simple, and enjoyable, and so is Schwartz′s book.” –Stewart Brand What increasingly affects all of us, whether professional planners or individuals preparing for a better future, is not the tangibles of life–bottom–line numbers, for instance–but the intangibles: our hopes and fears, our beliefs and dreams. Only stories–scenarios–and our ability to visualize different kinds of futures adequately capture these intangibles. 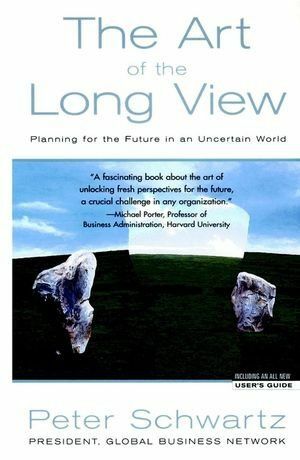 In The Art of the Long View, now for the first time in paperback and with the addition of an all–new User′s Guide, Peter Schwartz outlines the “scenaric” approach, giving you the tools for developing a strategic vision within your business. Schwartz describes the new techniques, originally developed within Royal/Dutch Shell, based on many of his firsthand scenario exercises with the world′s leading institutions and companies, including the White House, EPA, BellSouth, PG&E, and the International Stock Exchange. I used this book to help develop a process for scenario planning used in workshops with large corporate clients. It proved invaluable as a proven technique and I often gave the book out at the end of the workshop. In short the process seeks to identify a number of possible future events that are plausible but not and extrapolation of today’s events. I can still remember some of the possible future events that we discussed some fifteen years ago. Perhaps I have a selective memory but here are a few of the disruptive events that we discussed in our workshops – usually with energy clients. In thinking about these possible events we soon realised how little we all knew about certain technologies and political events. But the book is about more than just thinking about events. This is only the first step. The key is to take these events and bring them together into a number of internally consistent scenarios that can be used to test strategic options for robustness.